Below are Sucess Stories from Bramson ORT Students. Learn why they chose Bramson ORT College as their school of choice! Many of our graduates now work at top companies including Apple Inc., Citibank, Columbia Memorial Hospital, CVS/Pharmacy, Jamaica Hospital, Memorial Sloan Kettering Cancer Center, MTA, NBC Studios, New York Department of Health, New York Life Insurance, Time Warner Cable, TD Bank, Walgreens, Wyckoff Heights Medical Center, and many more! To find out more information about job placement, internships, and scholarships, visit our Career Services Office. Bramson ORT College Students Visit Top NYC Game Studio, Arkadium! This summer, Professor Dominika Juraszek and Professor Contreras took their 3D game design students to New York City’s top Game Studio, Arkadium. The trip’s purpose was to introduce students to different creative careers within their field of study. Students learned about the latest game design software, design trends, and technology from top design and production directors at the company. The 3D game design students also learned about top trends in 3D gaming and animation. During the presentation, students learned more about careers in game design as well as internship opportunities for the fall. The trip was a success! In addition to the Game Design and Programming Degree, the college also offers degrees in: Medical Assistant, Pharmacy Technician, Paralegal, Accounting, Business Management, Business Management Online, Office Technology, Computer Information Systems, Graphic Design Concentration and much more! For more information about Bramson ORT College’s in-demand programs visit www.BramsonORT.edu or contact an Admissions Specialist today at 718-261-5800. Become Our Next Bramson ORT Success Story! There are no limits to future opportunities for a college graduate, and Bramson ORT College offers a great amount of options to unleash true creativity. I enrolled at Bramson ORT College in February 2013 looking to pursue a career in technology. I wanted to expand my knowledge in computers and gain more updated skills. Bramson ORT allowed me to do this by providing me with hands-on training and giving me the skills required to succeed in my field. I am currently a full-time student at Bramson ORT College working towards my Associate Degree in Computer Information Systems. During my time at Bramson ORT, I have accomplished many things. I have designed and developed websites, created graphic designs using industry software, fixed hardware products, helped with desktop support, learned numerous programming languages, and much more. I also got to learn more about digital media, which allowed me to create my design portfolio during my internship. Recently, I was nominated for the 2014 Vanguard Awards in technology and have written about my experience being a female programmer in this field. I have helped inspire other females to pursue a field in cutting-edge technology. I am currently involved with writing programs and learning more about software development and design. Bramson ORT College gave me a great start, and it can give you one, too! Achieve your goals by taking the first step and enrolling at Bramson ORT College! In addition to the Computer Technology and Electronics Degree Programs, the college offers degrees in Medical Assistant, Pharmacy Technician, Paralegal, Accounting, Business Management, Business Management Online, Office Technology, Graphic Design Concentration and much more! For more information about the college’s in-demand programs visit www.BramsonORT.edu or contact an Admissions Specialist at 718-261-5800. 1. Business Law 1 (AC121): This course provides students with an understanding of basic principles of business and contract law and the relationship between commerce and the legal system. 2. Immigration Law and Procedure (PL140): This course familiarizes students with the the United States immigration and citizenship processes, as well as different types of visas and forms a paralegal handles in an immigration law firm. 3. Legal Research, Analysis, and Writing (PL120): This course trains the paralegal student search topics, how to write case briefs, analyze cases, and prepare persuasive oral arguments on behalf of their clients using primary and secondary sources, including the Lexis legal database, for legal research. Professor Cesar coordinates an oral Moot Court Competition every semester. She is working with the business and paralegal majors of Bramson ORT College to create the Bees of ORT Debate Club and a Music/Improvization Club. Professor Cesar received her Bachelor of Arts in French from The College of William and Mary, Master of Arts in Social Sciences from Edinboro University and Juris Doctor from University of Massachusetts Dartmouth Law School. She received her training in immigration law from Catholic Charities. Bramson ORT College is proud to have Professor Aïcha César on our paralegal faculty team! We welcome all prospective students to visit www.BramsonORT.edu for more information on the paralegal program. Bramson ORT College Students Create A New Game Club! 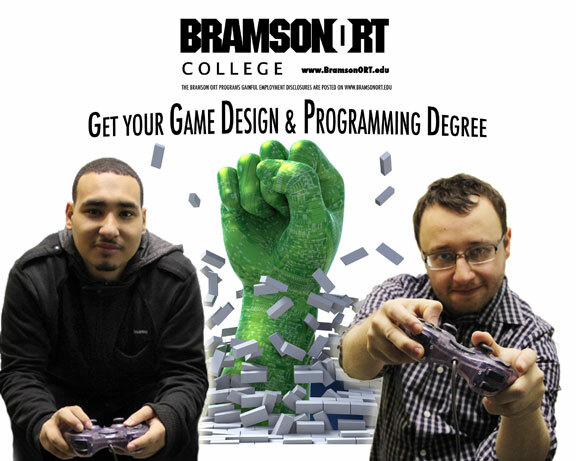 I enrolled at Bramson ORT College in February 2013 seeking knowledge in game design and programming. I already had my degree in media and wanted to gain more updated and hands-on skills in game design. My goal was to gain advanced skills and create a portfolio that would lead towards a career in the video game industry. During my first year at the college, I have met some remarkable people and learned a handful of new talents and skills. I am most appreciative of my newfound competency in programming fundamentals, CG modeling, and animation. One of the most important things I have done in my time at Bramson ORT was to help organize the Bramson ORT Game Design Club. The BOC Game Club was organized by a group of passionate game design students and faculty. The club is mostly run by students, but Bramson ORT’s faculty help oversee projects and deadlines. The team is currently working on an adventure and strategy game that will be showcased at the end of June. The game design team had arranged several visits to places such as Quirky Studios in Chelsea, the Global Game Jam at NYU Polytech, NYC Game Forum meetings at the Rockefeller Center Microsoft Building, APEX 2014 in Somerset, New Jersey, and the Indie Cade Expo at the Museum of the Moving Image located in Astoria. These wonderful educational experiences, in the classroom and beyond, have allowed the gaming students to meet a variety of people with their own types of passion for gaming. The trips have also given us exposure to professional game design techniques and industry experience. As my time at Bramson ORT is nearing completion, I have been able to acquire a remote internship with Primer Labs and their upcoming game, Code Hero. I had been one of the many people who helped fund the game’s production in 2011. With this project, there is a wealth of opportunity to reach out further and educate programmers and nonprogrammers alike on the concepts and execution of game programming through playing a game created on the Unity Engine. In addition to my internship, I will also be working with Game Truck New York as the head of their mobile laser tag division. I will also be working on a 2D side scroller with a good friend of mine from Bramson ORT College. I plan to continue pressing forward towards my goals. I feel more determined to continue learning through play, and incite ideas that will provoke thoughts, evoke feeling, and ultimately entertain. Bramson ORT College allowed me to gain the hands-on game design skills needed and opened up a door of opportunities for me. The Game Design and Programming Degree and Certificate Program at Bramson ORT College is one of the few well-rounded programs that offer courses in 3D modeling and animation using Autodesk Maya software, C++ Programming, Game Software Engineering, Game Engine Architecture, Game Programming Direct3D, Al Game Development, Game Audio Development, Java Games, Multiplayer Game Programming, Mobile Application Development, Game Console Programming and Programming Linux Games. These courses are designed to prepare students in many game design genres and platforms by focusing on both the technical and creative end of this growing and multi-faced field. 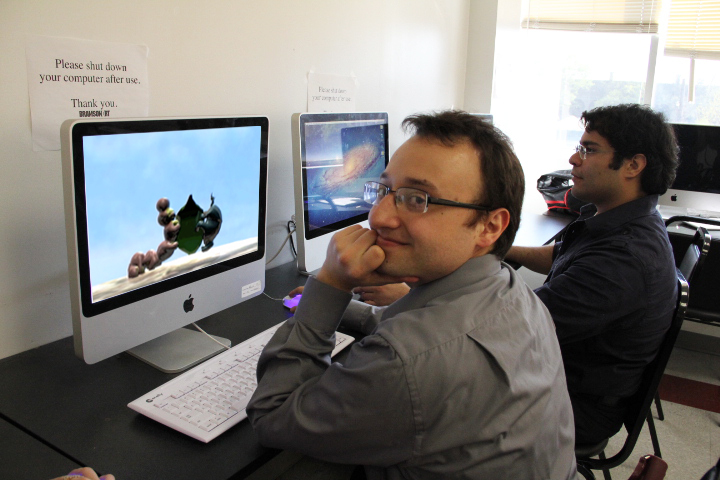 Courses in digital animation, character development and modeling, level design, interactive game storytelling, and light rendering add to the uniqueness of this program. Liberal Arts courses are also required such as Physics for Game Developer, Math for Game Developer and additional elective Liberal Arts courses for the degree program. The college offers career internships and job placement assistance through the Career Services Department. For more information about the game club contact Professor Dominika Juraszek at djuraszek@bramsonort.edu. 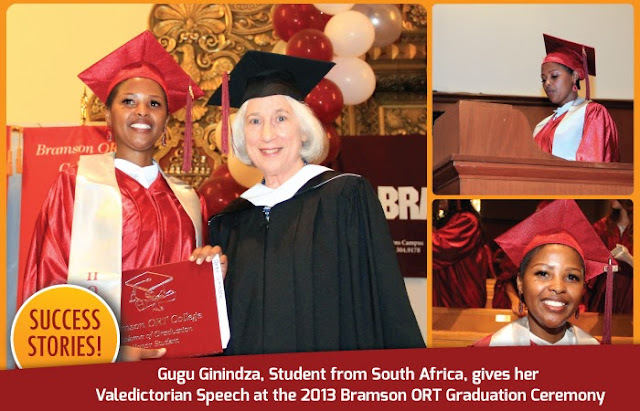 Biba, A Bramson ORT Student Success Story! My name is Biba Nadjoari and I was born in Burkina Faso, West Africa on January 1st, 1984. I emigrated to the United States of America in May 2007 to join my husband, whom I had met in 2004 in Burkina Faso. In 2008, we welcomed our beautiful baby girl, but things weren’t going well between us and we eventually separated in 2011. Life was very tough for me during that period, but I realized that God works in mysterious ways. I knew I would get my smile back. Today, I have a smile because of Bramson ORT College. I always thought about going back to school, but I never had the opportunity to. In January 2012, I bought “The Daily News” newspaper one morning when I was on my way to work. Though I had little time to look at it, something caught my eye in the job opportunities section. I saw an ad for Bramson ORT College that read “Become a Medical Assistant at Bramson ORT College in less than 16 months!” During that same week, I visited Bramson ORT College’s Brooklyn Campus to find out more information about this Degree Program. When I arrived, Ms. Vera Brenner welcomed me. She encouraged me to process my application as soon as possible and registered me for my Accuplacer test. I was not successful the first time, so she recommended I start free tutoring at Bramson ORT College. There, I met Ms. Zoya Yakubova, who encouraged me to take the test again. Again, I was not successful, so I continued my tutoring with Zoya. A few weeks later, she advised me to take the test again before the summer semester started in June 2012. This time, I successfully passed. Thanks to Bramson ORT staff, I was able to stay determined and not give up! In June 2012, I was finally able to start my Degree Program at Bramson ORT College, but then I lost my Home Health Aide job. This was a very difficult time for me, but I refused to give up college for any reason. For four months, I lived without a job and found it very difficult. A silver lining occurred when I finally got a full-time job in October 2012, around the time I was registered for my second semester. I was working day and night and still taking 18 credits at Bramson ORT College. I successfully completed my second semester and started my third semester. I then realized that my life was much better than it was before. During my fourth semester, I started my internship at Dr. Ofem Ajah’s office at The New York Methodist Hospital in Brooklyn. Dr. Ajah and his staff loved me. He really appreciated my professional performance and skills, so he offered to hire me. I completed my application at The New York Methodist Hospital and went in for the interview. As a result, I was successfully hired with a full time job in August 2013. I completed my internship at the end of August and received my two-year Medical Assistant Associate Degree in October 2013. The Medical Assistant Program at Bramson ORT College offers students numerous opportunities and teaches them valuable real-life skills. Obtaining multiple skills increases your chances of working in any health care facility or health related company. There are many doors open for Medical Assistants even in this tough economy. Bramson ORT College made my dream come true! I finally have a career that I love. I am working full-time as a Medical Assistant at The New York Methodist Hospital and I have transferred my Bramson ORT College credits to CUNY for enrollment in a nursing program. I now believe that I can take good care of myself and my daughter and still further my education. I am very grateful to Bramson ORT College for this wonderful experience, and will always recommend the college to all. I will never forget my professors, who always made me laugh even when the going got tough. I would like to thank all my Professors, Bramson ORT staff, and my classmates for their support. Thank you for helping me live my dream! A special thank you to Dr. Ofem Ajah and all others who enabled me to get the career of my dreams at New York Methodist Hospital! “As a Computer Science Professor, I don't just teach students how to program. My goal is to help students develop a passion for programming and learning,” stated Professor Waxman, who helped develop the Cisco Networking Program that leads to certification. Both the Game Design and Cisco Networking Programs will help students obtain high paying employment in a tough economy. The introductory courses are designed for students with no prior knowledge of programming. Since all calculations are done using the computer, students do not need advanced mathematical skills. The Cisco curriculum gives students the opportunity to get hands-on training with a combination of programming and networking skills. Cisco routers can be programmed to solve networking issues, including high-speed transmissions and remote data applications, Local Area Networks, and Wide Area Networks. The world depends on Cisco systems for networking. Cisco is a leading indicator in terms of economic growth. Professor Waxman assisted with the development of the Renewable Energy and Graphic Design Programs as well. As a goal for the future, he would like to see Bramson ORT become a four-year college. In his view, most of the students would like to obtain a four-year B.S. or B.A. degree from Bramson ORT College. The good news is that most of our students can transfer their credits to institutions of higher learning upon graduation. Many of our students gain employment in their field of study thanks to the great work of our Career Services Department that assists with internship and job placement opportunities. Now that is above the average. Professor Waxman grew up in Brooklyn, New York. He has a B.A. degree from Brooklyn College in Speech with a minor in Mathematics, a M.S. degree in Mathematics and Education from Richmond College, and a P.D. degree in Educational Administration from St. John’s University where he is currently enrolled in an Administration Doctoral Program, which he intends to complete by the end of the year. His mathematics achievements include a license in mathematics and an appointment to ESEA Title 1 Corrective Mathematics Program. In this capacity, he screened and implemented remedial mathematics programs for Catholic schools and Yeshivas for 12 years and was the Assistant Principal for mathematics in Dewitt Clinton High School, where he witnessed improved student mathematics scores. Professor Waxman was a treasurer in Bayside High School and taught English, math, computers, and speech at Breuer's High School, as well as mathematics at Yeshiva University High School. His vast educational experience makes him one of Bramson ORT’s most accomplished faculty members. His computer science achievements include a Mellon Scholar in Computer Sciences, writing the AP Computer Science curriculum and becoming the computer coordinator for D.C.H.S., while at the same time becoming the president of the Computer Coordinators Association for the Bronx and associating with Mercy College Computer Science Department. In 1997 he became a Professor at Bramson ORT College. In addition, his speech pathology expertise led him to be associated with the NYIT Speech Department. He is also an expert in writing, research, and educational administration and curriculum construction. He has a license in administration supervision through the superintendent of schools. With his extensive technical and educational background, Professor Waxman is one of the driving forces behind Bramson ORT’s Computer Science Department. At Bramson ORT College, the faculty and staff reflect high educational standards and leadership in their fields. In addition to the Computer Technology and Electronics Degree Programs, the college offers degrees in Medical Assistant, Pharmacy Technician, Paralegal, Accounting, Business Management, Business Management Online, Office Technology, Graphic Design Concentration and much more! For more information about the college’s Computer Networking, Programing, Gaming, Electronics, and Renewable Energy Programs visit www.BramsonORT.edu or contact an Admissions Specialist at 718-261-5800. For a limited time, the college is offering a $500 scholarship towards student’s tuition! Start your new career by calling to enroll today! I Started my Dream at Bramson ORT College! "My name is Lu Hui Qiu. I am 39 years old with two kids and my lovely wife. I chose to pursue my goal last year and enrolled at Bramson ORT College. I am a Traditional Chinese Acupuncturist. I use acupuncture and massage techniques to help patients with pain and other symptoms. As my father was an Urologist and Surgeon, I always knew there would be better results if patients could receive a combination treatment of western medicine with eastern traditional medicine. My goal is to become a Physician Assistant and Bramson ORT College was the start of my dream. The Medical Assistant Program is an affordable alternative to entering directly into a four-year PA Program. I chose the Medical Assistant Program at Bramson ORT College as it has courses that match the prerequisite courses for the PA Program. With the help from Bramson ORT’s friendly Admissions Staff and the Financial Aid Department, the enrollment went smoothly. The flexible class schedule suits my need to work and take care of my family. The engaging professors, small class size, and supportive classroom and lab environment make the study efficient and fun. I finished my internship two weeks ago. The clinic that I interned at hired me upon completion. The doctor was so satisfied with my knowledge and the advanced skills that I acquired at Bramson ORT College. Moreover, I successfully transferred most of the course credits to CUNY York College's Physician Assistant Program." Bramson ORT College Taught Me the Skills and Knowledge Required to Make it in The Gaming Industry! "My name is Adam Alicea and I graduated with an Associate Degree in Game Design at Bramson ORT College. Before I started my education at Bramson ORT College, I was working at an uneventful security job. I knew I didn't want to do this for the rest of my life and I had a desire to obtain a career relating to the art field. At the time, I wasn't sure what my options were. I had dropped out of high school, which put me at a major disadvantage as a workforce candidate. A friend told me about Bramson ORT College's High School Equivalency Program. I learned that you could obtain your High School Equivalency while earning college credit at the same time. I immediately jumped onto this opportunity and enrolled at Bramson ORT College. This single decision impacted my future. I enrolled as a Game Design and Programming major. I learned about Game Design starting from the basic principles to the intermediate concepts. This unique program introduces students to all types of design aspects from developing characters and understanding how they work, to understanding the business aspects and developing good stories for games. The Game Design Associate Degree Program also introduces you to intermediate aspects of programming for game and character development. I was introduced to Autodesk Maya, an industry software application used for 3D animation, 3D modeling, simulation, visual effects, rendering, and compositing. With Maya, I learned how to develop 3D models for games and animations. In my first few classes, I realized that I wanted to design characters for video games and become a successful Game Designer. During my studies, Bramson ORT College's Career Services Department helped me obtain an internship as a Game Tester for Power Head Games. As a game tester, I had to document any issues or errors in video games and send these reports to the Game Developers. This role is very important because it involves all the mechanics of a game, such as the art, sound, hardware, and software. Without these aspects, the game cannot be completed. The whole process of creating a game from start to finish is amazing and challenging. Everyone I worked with had strict deadlines, and we had to finish our duties in a small amount of time. I witnessed how hard everyone had to work to finish completing the game, and I pushed myself to do the best job possible. I received an A following the completion of my internship. I came to the realization that what I learned was more important than receiving a good grade. I learned something that I could take with me in any situation. It was the idea and understanding that through any situation there will always be a struggle. There will always be some type of frustration or letdown or days when you feel like quitting. But through your struggles, you end up building something without realizing it. This is called character. Character can be a strength that takes on any situation. Sometimes knowing or not knowing what is really involved and building a strong character is a tool that will help you to grow as a better person for the rest of your life! Bramson ORT College taught me the skills and knowledge required to make it in the gaming industry! I am glad that I found my path at Bramson ORT! You can view my first short 3D Animation student film by clicking here!" Why Choose Bramson ORT College? Hear What Our Top Graduates Are Saying! My classmates and I are very grateful for our talented instructors and advisors, whose caring, and constant dedication have been instrumental to our success here. I am personally thankful, for having the opportunity to study under Professor John Howell, his advice, along with his extensive knowledge, has inspired me to broaden my horizons. And then, there is our Zoya, her guidance and enthusiasm, were priceless to me. Our problems were always important to her, and her inner light could brighten up anyone’s day. We also owe a debt of gratitude to our school, Bramson ORT College. Bramson is member of the “World ORT” organization. ORT was founded in Russia in the year 1880, with the noble mission, to provide much needed technical knowledge and skill, to members of the Russian Jewish community. Today, over 130 years later, ORT’s founding purpose is still being realized, along with some significant advancements. ORT schools, such as ours, have opened their doors to the entire world community. Over the years, they have promoted education and training to all who are willing to learn in more than 100 countries. You can clearly see the proof of that here today, by the great variety of faces in our graduating class. Graduates, I know that many of you feel as fortunate as I do today. Virtually every one of us has family members or forebears who have made sacrifices on our behalf. Our predecessors made those sacrifices so that we would have a better life and could have a positive impact on society. Most of their dreams were not for themselves, but for the success of the next generation. Today, you have fulfilled their dreams, and justified their sacrifice. This is a great accomplishment, and you should all be very proud. We have worked very hard for our degrees & certificates, and we have earned this day. We should enjoy this moment fully, but also be mindful, that with today’s achievements will come tomorrow’s responsibilities. We have gained an education and now we have the obligation to use what we have learned to better our lives, and to benefit humanity. -For what man, is truly a man, who does not try to make his world better? In recent times, we have seen our share of inept and self-serving individuals in places of power. It seems as if an epidemic of selfishness and greed has infected a large portion of the population. Our country is now in great need of real leaders. Leaders with integrity and with vision, whom we can all rally behind. Leaders whose first priority lies with the betterment of the people they serve, and not with the enrichment of their own bank accounts or celebrity. My friends, I urge you, to see your diploma not only as a passport to the good life, but also as a permit to help create a better life for all. Each of us can be a leader, or an advocate for change, in whatever profession we choose. For if you improve life for one of us, you have, in turn, improved life for all of us. My colleagues, I call upon you now, to follow in the footsteps of those who dreamed of your success. Make it your goal to initiate positive changes for the benefit of future generations. Make it your dream to accomplish something greater then yourself. And Make this day, this day, be the start of a journey that will culminate with a legacy of respectable leadership, environmental enrichment, and the advancement of all humanity. And allow these words, from Emerson, to guide you. BRAMSON ORT COLLEGE CONGRATULATES THE CLASS OF 2013! This June, Bramson ORT College held their graduation ceremony at the Forest Hills Jewish Center. Staff, faculty, friends, and parents gathered to congratulate the class of 2013. Students delivered captivating speeches reflecting on how Bramson ORT aided them on their path to success. Many shared their personal life stories during the graduation. One such powerful speech was delivered by Jessica Florez. Jessica enrolled in the Medical Department with a concentration in Medical Billing and Coding. On the day of her graduation, she shared her story of struggle, transformation, and victory in a speech that moved many in the audience. My name is Jessica Florez and I am a woman who was born and raised in Brooklyn, New York. This year, I achieved my goal of graduating college. I came to Bramson ORT College inquiring about information on how to become a student and I decided to enroll. It has always been a dream of mine to graduate college and have a successful future in a medical profession. During my time at Bramson ORT College, I was faced with tragedy that forced me to struggle throughout my semesters. On September 29, 2009, I enrolled at Bramson ORT College with great excitement to be taking a step forward in furthering my education. I was eager to share the news with my mom and brother and contact my father. I received a phone call that evening and had to face the worst possible news about my father’s death. My father had suffered a heart attack. For me, losing a parent and not having them be able to witness one's joy and happiness is incredibly painful. I didn’t want to go back to school and I was missing a lot of my classes. But something came over me during that time. It was like I had my father by my side saying, “Jessica you have to finish school! I want you to achieve your hopes and dreams and I will be looking down at you.” So, I pulled myself together and I conquered this for him. Even though my dad couldn’t be with me on my graduation to celebrate this special day, I know he’s here in spirit. Losing a loved one like my dad has motivated me to graduate. I know I’ve made him proud. I want to state that things aren’t easy in life. In order to become someone and grow as an individual you are going to have to face struggles in life, but you can overcome them as I did. I’m glad that I pushed myself towards the right direction to finish college and go after what I want in life. I want to thank my mom who brought me into this world. She has always encouraged me to do the right things and has always supported me. My mom always wants what’s best for me and I love her. I also want to thank my friends and family who have supported me throughout this journey. I wanted to say to my dad what I did not get a chance to say to him, “Dad, I love you and miss you and will continue to make you proud!” I want to thank the staff and professors at Bramson ORT College who were there for me and believed in me as a student and as an individual. My experience at Bramson ORT will never be forgotten and I will take that with me always. Thank you to everyone at Bramson ORT College for the opportunity to share my story! I greatly appreciate it! And to my fellow classmates, good luck to each and every one of you. Thank you! In today’s tough economy, students and parents of high school graduates should consider the benefits of a non-for-profit school such as Bramson ORT College that provides affordable tuition coupled with great scholarships and hands-on educational opportunities. The staff and faculty work closely with the students to help prepare them for in-demand careers. Bramson ORT has a strong career services department that assists students with internship opportunities and job placement. The college is close to major transportation, including the E, F, N, R, M, and D subway lines. For more information call (718) 261-5800 or visit the main website at www.BramsonORT.edu. The college has a blog where visitors can read the latest news, testimonials, and student success stories here. Be our next success story! Register today! "My name is Gugu Ginindza. I am a Bramson ORT student. I am from Swaziland in Southern Africa. I am the first-born of three. I have a sister and a brother. My parents are both deceased. I am the mother of three boys and have been married for ten years. I came to the United States to join my husband who is currently enrolled at Columbia University. One day my husband was passing by Bramson ORT and he decided to come in and get information on how to apply. The staff at the Admissions Office were very friendly and welcoming, and they gave him all the information he needed. A few days later, I came in to complete the application process and that is how I enrolled at Bramson ORT. Bramson ORT College gave me a chance to embark upon my educational dream. I had applied to other schools before, but I was rejected because I did not have any educational background in the U.S. While at Bramson ORT, I learned a lot and the learning environment with professional and caring professors made it easier. I thought that I would have a hard time fitting in being a foreigner, but everyone was welcoming and I felt like other students. Currently, I am enrolled at York College, CUNY. I enrolled as a Biology Major. My goal is to enroll as a medical candidate by fall of 2015. The education that I garnered from Bramson ORT has been very beneficial, and I realize that it gave me a head start for my education in the medical field. I would not have been able to pursue my educational goals if Bramson ORT had not given me a chance. Now that I have my Medical Assistant Degree, my options are endless. I have plans to get a part-time job as a Medical Assistant and continue my education full time. I would recommend Bramson ORT to any student who wants to get started on their education or career in the medical field." Bramson ORT led me to a Golden Path! "Why did I become a college student? After being employed at my former job for a decade, I was laid off. I was hurt, scared, and confused, and I didn't know how I would be able to survive without a steady income. It has always been a dream of mine to further my education. Education has always been, and remains, one of the key values in my family. I wanted to convey the importance of education to my children, without being a hypocrite. Though I would be receiving unemployment benefits, I knew this would give me the opportunity pursue my long time dream of obtaining a college degree. What better way to set an example for my family than to show them that I could earn a college degree while being a mother, babysitter, and household manager? Yes, women wrote the book on multitasking! I knew that pursuing a college degree would be a challenge, and that it would take a lot of hard work, but I believed in myself! I began researching two-year colleges and learned about Bramson ORT College. The small class sizes, diverse student body, and hands-on training caught my attention. Having been out of school for a long period of time, I knew I would need some encouragement and individualized help from my instructors. Their support was wonderful and gave me the positive boost I needed. I enrolled in the Medical Assistant Associate Degree Program at Bramson ORT College. I knew that because of the tremendous growth in the health service industry, I would have a better chance of being employed in this field. In less than two years, I landed my dream job as a Medical Assistant! Through this life changing experience, I've learned that you should always aspire to achieve your goals, no matter what obstacles may get in your way. Never stop believing in yourself. With perseverance and hard work, "YOU" can make it happen! If you believe in your dreams and work hard towards your goals, doors will open up in ways you'd never have imagined. I believed, achieved, and succeeded, and you can too!" "One of the greatest things that I love about Bramson ORT College is how hard the professors pushed me to do my best to succeed. The professors are always willing to help, they are patient, kind and compassionate. Special thanks to all my professors who jumped down my throat whenever I wanted to give up. Professor Mary Butler, Steve Harris, Lashin, David Marnell, Bogden Ganshi, Yelena, Etelle Weiner, Geoffrey Waxman, Deda, Mila, Steve Holman, Khan and all the other professors I forgot to mention. Thank you, because of you I have a brighter future." I was born in Noakhali Bangladesh. In 2001, I came to the USA with hopes and dreams of becoming a millionaire at the age of nineteen. Ever since I came to America, my goal was to go to school and get my degree. They say education is the great equalizer and the way to success. Bramson ORT College made this dream possible for me! I worked for a bank from 2005 to 2010. After seeing a newspaper ad about the school, I enrolled as a business management major at Bramson ORT in 2010. I chose Bramson ORT, because Bramson ORT chose me as a student without seeing my color or nationality. The college made me feel like I was part of the family and community. I felt challenged by the academic rigor offered in the classes. I was able to gain extensive knowledge about a variety of subjects such as Accounting, Economics, Business Communications and Statistics. My instructors were excellent and always ready to provide me with additional help if I did not grasp the material. The college provided free tutoring and career internship programs. The additional personalized assistance allowed me to excel in my classes and beyond. Also, I enjoyed making many connections with the other Bramson ORT students. They are intelligent, hard working, and eager to help others. I appreciated the small class size, which enabled me to develop good relationships with my professors and classmates. Lastly, I appreciated Bramson ORT's administration and staff. When I had difficulties paying for my tuition in the last semester, the Bursar's Office worked out a payment plan and provided a partial scholarship for me. I am indebted to the school for believing in me and my future potential. I will never forget Bramson ORT as I continue to build my career in the financial industry. I remain connected with their Alumni on their LinkedIn and Facebook networking sites. Currently, I am studying towards a Bachelor of Business Administration at Baruch College. My goal is to finish my Bachelors Degree by 2014. I belong to a club at Baruch where we raise funds for public schools. My participation in the club has fulfilled my desire to help others. My future goal is to work for Grameen Bank and help lower income people. Baruch is my dream school and Bramson ORT made that possible by preparing me for a higher education and the “Real World.” I am currently working my other dream job as a business manager. If I can do it, I know anyone can! In the ever-changing and challenging world of technology, very few individuals have the opportunity to receive truly personalized and high-quality training. I was very fortunate to have that opportunity at Bramson ORT College. Soon after graduating high school, I had to make a tough decision that would, as I found out, forever change my life. Choosing a higher education path was not an easy task, but I decided to choose a college that would provide a foundation to fulfill my dreams. I was looking for a college that would help me develop my technical skills and guide me in the correct direction. After applying to various universities and colleges, and taking entrance exams, I chose Bramson ORT College because it was the perfect fit for my needs. I enrolled in the Electronics Technology Program but switched to the Computer Technology Program because I was able to get hands-on training with computers and that opened a whole new world of possibilities. At Bramson ORT College, I received a solid foundation in the field of Information Technology. My professors were very helpful and provided real-world scenarios in the classroom. I was also very fortunate to have access to additional student resources, such as a well-stocked library and state-of-the-art computer labs, career and internship placement, and free tutoring that was always available. In addition to classroom training, I started working as an assistant in the Computer Technology Department and eventually worked my way up to being employed by Bramson ORT College as a Network/Systems Administrator. The education I received at Bramson ORT provided a strong foundation, and I was able to further my studies to obtain a Bachelors of Science in Information Technology. More importantly, I made valuable connections during my time at Bramson ORT College. I started my own Technology Consulting Business and many of my clients can be traced back to the college. It is thanks to the skills gained during my education, that I am now a successful business owner. I am grateful and very fortunate to be a part of this wonderful and caring organization. To show my appreciation, I currently work as a consultant to the college, giving back with hopes that it will generate more success stories. I recommend this college for anyone who is serious about their career goals and dreams and wants to get their foot in the door! Bramson ORT College Welcomes International Students! "I saw the ad for Bramson ORT College while I was visiting NYC with my mom. I was just discussing with her that I was interested in going back to school for web design when I saw the sign, so I took it as a sign. I called Bramson ORT College when I went back to Canada and asked them about international visa, what I would need to enroll and how I can study the program and make the transition to move to NYC. The staff were extremely helpful at the college, so I applied. I also wondered how I would be able to support myself in NYC without being able to work for the 2 year program. I went to the OSAP website (which is part of the Canadian Student Loan), and found out they also fund for students studying outside of Canada as long as the school first gets approved by them. I applied for the school to get approved (this took about 3 months), the school was approved, and now OSAP funds Bramson ORT College, as long as the school maintains this eligibility every year onwards. Now students can find Bramson ORT while registering for a student loan on the OSAP website. Once I got accepted into Bramson ORT College, they sent me an I-20 after I paid my deposit for classes. Originally, I called the US Embassy to make an appointment for a visa interview, they told me that there is no interview for Canadian citizens and I can just take my I-20, SEVIS fee receipt, proof of ties to Canada to any US Port of Entry. I was driving into NYC with my family with my I-20 and the border officials brought me inside, took the I-20 and my passport to basically process it for student visa. They simply asked me about my program and where I plan on staying during my study course. I gave them a relatives address and mentioned I will stay there until I find my own place or a roommate. They also asked how I plan to support myself while I am there, and I simply said I have a Canadian student loan and also my family will help me. They simply stamped the F-1 Visa on my passport, and I paid a $5 fee and then came to NYC. I have now begun my studies at Bramson ORT College, and have been productively learning Computer and Internet Programming. The staff here were completely helpful in terms of helping me find accommodations, filling out any student loan documents and ensuring a positive experience in my course. There are many opportunities for Canadians to study, learn and also participate in OPT programs while they are in school in NYC. NYC is convenient to live in as trains go everywhere, and it is a great place to build experience while studying." Bramson ORT College Offers a Retraining Program For Students With Liberal Arts Degrees Who Want Hands-on Technical Skills that are In-demand! Alexandra is a recent graduate from Syracuse University and a participant in Harvard University’s International Law Program. Now as one of the top liberal arts college graduates, she anticipates enrolling in a technical school. Why are so many liberal arts college graduates enrolling in technical colleges? Technical schools such as Bramson ORT College offer Professional Retraining Programs that enhance students’ skills by offering hands-on and marketable trades in today’s tough job market. Read Alexandra’s story below and discover the benefits of joining an in-demand degree program today! There are many reasons why a technical school education is appealing to a liberal arts graduate such as myself. I find the necessity to sharpen what I lacked in my education- a trade! In this job market, competition is at its peak. To assure oneself a trade is the smartest thing one can do. I majored in French and International Relations. What can I declare at the end of my four years of study? I submerged my life in academia, but has it helped me find a job? Students across the nation are asking the same question. This is where a polytechnic education comes in handy. It will give you the key to not only apply what you learned with your Bachelors Degree, but also help your coveted eloquence and technical training stand out in the competitive job-market. You can prove what you know in theory with the hands-on experience that many employers perceive as desirable. Having received a diverse and international education, I now want to go back to school to compliment my knowledge with the skills that are sought after in high demand. We are living in the digital age, surrounded by constantly changing technology. If you are not on the computer, then your business is already antiquated. I know that I can acquire an advanced technical skill-set by returning to a (technical) school and learning computer operations, programming, graphic design, game design, and all things that are most importantly, in-demand. It’s never too late. Technical schools with retraining programs such as Bramson ORT College offer hands-on skills in addition to internship and job placement assistance. In many ways, technical schools can teach you practicality. You would be learning a set of skills that help prepare you for the “real world.” New jobs are surfacing and old ones are constantly updating their staff. This is where a technical institute will distinguish you from the rest. In today’s economy, many employers require HTML proficiency, knowledge of programming, experience in user-interface, web design, renewable energy technology, and many more. Liberal arts students can explore and sharpen their skillset by enrolling in a technical college. In most cases, liberal arts credits can be transferred towards the new degree. Private non-for-profit community schools, such as Bramson ORT, keep the tuition low and the hours flexible, so education is affordable and accessible. Discover the opportunities waiting for you! You Don't Need 6 Years of College to Begin Your Medical Career! Become a Medical Assistant or Study Medical Billing & Coding at Bramson ORT College! In today's tough economy, Medical Assistants are still in high demand. Medical Assistants maintain the offices of physicians, other health practitioners, and hospitals by performing routine clinical and administrative tasks. According to the Bureau for Labor Statistics, Medical Assistants Jobs are to grow over 31% over the next few years (much faster than average). This is a rapidly growing field particularly because medical offices are seeing more patients and growing their practices. Bramson ORT College offers complete Medical Assistant Programs up to the latest industry standards. Many students get their degree in less than two years. Students will feel confident by taking the knowledge they have acquired at Bramson ORT into the workplace. In fact, the Medical Assistant Degree Program is one of the most popular at the school. With enrollment growing in high-demand fields such as this, Bramson ORT College offers career internships and job placement assistance to complement the hands-on classroom experience. The tuition is affordable and the schedule is flexible providing weekend and evening classes. Change your future today and enroll in a degree program that can make a difference! Bramson ORT College also offers Medical Billing and Coding and Pharmacy Technician Associate Degrees. Many of our students get "real world" experience through our internship programs! My name is Marina. In 2005, my family and I immigrated to Russia. In 2009, we came to the United States. In 2010, we settled in New York. The experience of two immigrations gave me an opportunity to meet people from different cultures and to get to know different traditions. At first, it was very difficult adjusting to New York life. The process of adaptation, including searching for jobs, the language barrier, and my nostalgia for family and friends, served as an obstacle. I was ready to work hard and take on the challenge by continuing my education. I discovered Bramson ORT College while my mother and I were exploring our new neighborhood. We were passing by Austin Street and noticed Bramson ORT College signs. I had a big aspiration to continue my education in the U.S.A. I wanted to improve my English and advance my knowledge and professional skills. Bramson ORT College seemed like the place for me. I decided to attend the college because of its diversity and multicultural environment that reminded me of my immigrant background. I also decided to attend Bramson ORT College because it reflects an atmosphere of acceptance, comfort, and support. Professors and counselors closely guide me through all my educational goals and help me progress to the next level. My college helped me transition and gave me the preparation for the real world needed in today’s economy. Currently, I am in the process of finishing the required curriculum to complete my Business Management Associate Degree at Bramson ORT College. I am also working at the Financial Aid Office as an advisor assisting students with financial aid. Bramson ORT College gave me an opportunity to fulfill my goals. It has been a tremendously positive step towards improving my future and has helped me succeed. My next step is to pursue my Bachelor’s Degree. With a 4.0 GPA, I was accepted to one of the top Business Programs at Baruch College. Bramson ORT College will always stay in my heart and memories as a second home here in America! I had a great time participating at Washington DC's General World Assembly. It was great fun to present my marketing products and meet other international students part of the ORT school network! Bramson ORT's Top Game Design & Graphic Design Students Go To Washington DC to Present Their Work at the ORT General Assembly! I enjoy drawing, inking, and painting. However, finding a career as an artist is difficult and ORT provided me with a way to apply my creative talent onto the digital world. I teamed up with other students to put together a simple interactive video game presentation for this year’s World ORT General Assembly. My partner, Steve, a Game Design major, assisted me with the coding. I used my creative skills to design character sprites and an informational website about the game. I am almost finished with my degree at Bramson ORT College and am planning to expand my skills and knowledge even further by continuing my education. Showcasing our work at Washington DC was great fun! 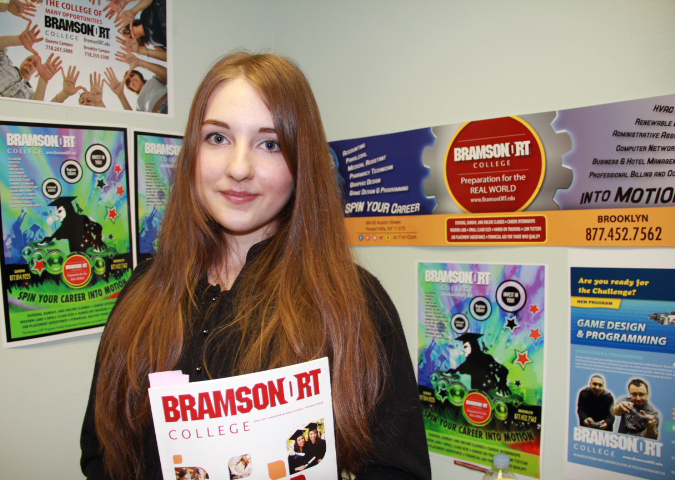 My name is Victoria and I started going to Bramson ORT College in the year 2010. I graduated from the two-year program receiving my Associate Degree as a Medical Assistant. My experience with Bramson ORT College was a great journey. Going to school felt like a prize. I learned a lot of new things about the body and how everything works. The teachers were great and assisted me when I needed a helping hand. After my time at Bramson ORT College, I decided to go further with my education. I applied to Hunter College and took EMT classes to further my knowledge in the medical field. I am currently taking nursing classes at Hunter College and my goal is to finish all the classes and maybe even go on to become a doctor. I can’t tell you how much I love to help people and save lives. It’s probably the best feeling in the world to make somebody's day, at least for me it is. I had a great time at the General World ORT Assembly in Washington DC this summer! It was a great experience meeting so many talented ORT students. My name is Maria. I was born in Russia. At the age of 9, I went to live in Israel with my Family. After 11 years, my family and I decided to come to America. When I came to America, I started working at the Queens Mall. At that time, I spoke and understood a bit of English. After working 2 years at the Mall and a variety of stores, I got a job working as a Medical Biller with my cousin. In 2006, I got married and had two kids. After having my children, I decided to go back to school to get my college degree so that my children and I could have a better life. I began studying at BRAMSON ORT College. I wanted to get my Medical Assistant Associate Degree with my High School Equivalency. When I first started at BRAMSON ORT College during my second semester, I did a work-study program at a medical office. There, I learned how to work with doctors and nurses in a real medical field. Bramson ORT College transformed my life by giving me such hands-on career opportunities. Also, I have learned a lot from the professors, including: how to draw blood, how to do EKG’s, and how to take patients’ Vital Signs. So far, being at BRAMSON ORT College has taught me to be more professional and confident. My goals are to finish college, find a job as a Medical Assistant, and plan on continuing my education to become a nurse. If someone told me that they decided to go to college for their Associate Degree, I would proudly recommend BRAMSON ORT College! I had a great opportunity this past summer. I was part of a group of top Bramson ORT Students selected to present projects at the ORT General Assembly in Washington DC. This was a great experience!!! The Paralegal Department faculty is composed of esteemed and experienced attorneys who are specialists in their legal fields. Today we are showcasing Professor Steven Stern. TSteven Stern, Esq. is a founding partner of Stern & Schurin LLP. In addition to his broad range of knowledge and experience in the arena of utility patents, Mr. Stern has established himself as an expert in design patent law, a field in which he routinely counsels and provides opinions to clients in the consumer retail and jewelry industries. At Bramson ORT College, students get to learn hands-on skills in their field from industry professionals such as Professor Steven Stern. The college welcomes international students and promotes campus diversity. The Career Services Department assists students with career internships and job placement . If you or your school is interested in Bramson ORT's Paralegal Program, online courses, degree or certificate programs, contact the college today. The school provides affordable tuition coupled with great scholarships and hands-on educational opportunities. There are 19 degree programs to choose from and many certificate programs as well. The college has campuses in Brooklyn and Queens close to major transportation, including the E, F, N, R, M, and D subway lines. For more information, call 718-261-5800. The Paralegal Department faculty is composed of esteemed and experienced attorneys who are specialists in their legal fields. Today we are showcasing Professor Tanisha S. McKnight. Tanisha S. McKnight, Esq., is a graduate of Brooklyn Law School, 04’. She began her legal career with The Legal Aid Society where she worked both in their Criminal Defense Division and Juvenile Rights Practice. In 2009, Ms. McKnight became The Children’s Law Center of New York's (CLCNY) first Director of Paralegal and Volunteer Services. In addition to managing the paralegal staff city-wide, she practices law in a number of areas including custody, visitation, domestic violence and child protective proceedings. She is also responsible for developing and managing CLCNY’s volunteer programs, which includes forming internship partnerships and recruitment with local high schools, universities and law schools, the development of CLCNY’s pro bono practice and law firm relationships and managing fellows both legal and non-legal based. She presents at local schools on the current issues facing family law practitioners and provides motivational talks to students considering entering the legal profession. At Bramson ORT College, students get to learn hands-on skills in their field from industry professionals such as Professor Tanisha S. McKnight. The college welcomes international students and promotes campus diversity. The Career Services Department assists students with career internships and job placement . If you or your school is interested in Bramson ORT's Paralegal Program, online courses, degree or certificate programs, contact the college today. The school provides affordable tuition coupled with great scholarships and hands-on educational opportunities. There are 19 degree programs to choose from and many certificate programs as well. The college has campuses in Brooklyn and Queens close to major transportation, including the E, F, N, R, M, and D subway lines. For more information, call 718-261-5800. The Paralegal Department faculty is composed of esteemed and experienced attorneys who are specialists in their legal fields. Today we are showcasing Professor W. Zehava Schechter. W. Zehava Schechter, Esq. is the Coordinator of the Paralegal Department and an adjunct instructor at Bramson ORT College. Professor Schechter concentrates her private practice in real estate law, contracts, business formation, estate planning, estate administration, and general practice litigation. She is admitted to the Bar of New York (1989), Massachusetts (1989), and Isrel (1993). Ms. Schechter graduated with a B.A. in Politics in 1983 from Brandeis University and received her J.D. in 1989 from Suffolk University Law School. Professor Schechter teaches Real Estate Law, Law Office Management, Probate and Estate Administration, Torts, Family Law, and Business Law. Throughout her 24 year legal career, Professor Schechter has practiced in secular courts and Batei Din (Jewish religious courts). She began her career as a public defender with the New York Legal Aid Society, Criminal Defense Division. Her career has included law firm practice as well as sole practitioner status, both in New York and Israel. Ms. Schechter's favorite quote is “You Miss 100% of the Shots You Don’t Take” (attributed to Wayne Gretzky). In addition to her faculty position and law practice, Ms. Schechter is an author, a New York court-certified Hebrew interpreter, and the owner of a successful custom window treatment business. At Bramson ORT College, students get to learn hands-on skills in their field from industry professionals such as Professor W. Zehava Schechter. The college welcomes international students and promotes campus diversity. The Career Services Department assists students with career internships and job placement . If you or your school is interested in Bramson ORT's Paralegal Program, online courses, degree or certificate programs, contact the college today. The school provides affordable tuition coupled with great scholarships and hands-on educational opportunities. There are 19 degree programs to choose from and many certificate programs as well. The college has campuses in Brooklyn and Queens close to major transportation, including the E, F, N, R, M, and D subway lines. For more information, call 718-261-5800. The Paralegal Department faculty is composed of esteemed and experienced attorneys who are specialists in their legal fields. Today we are showcasing Professor Aicha Cesar. Professor Aicha Cesar is a member of the Paralegal Department faculty who teaches Legal Research and Writing, Immigration Law, and Business Law, Professor Cesar earned a Bachelor of Arts in French from The College of William and Mary, a Master of Arts in Social Science from Edinboro University of Pennsylvania, and a Juris Doctor in Law from Dartmouth Law School. Her legal interests and specialty are in immigration, international human rights, and political asylum. She received her training regarding refugee law and United States foreign policy on international law on the migration of displaced peoples from two international non-profit organizations: International Rescue Committee and Catholic Charities. Her legal experience in immigration matters was advanced while employed by the Manhattan law firm Fragomen, Del Rey, Bernsen and Loewy. Ms. Cesar is a specialist in French legal translation and interpreting and has volunteered her legal translation and interpreting services for Sanctuary for Families, a domestic violence non-profit organization. At Bramson ORT College, students get to learn hands-on skills in their field from industry professionals such as Professor Aicha Cesar. The college welcomes international students and promotes campus diversity. The Career Services Department assists students with career internships. If you or your school is interested in Bramson ORT's Paralegal Program, online courses, degree or certificate programs, contact the college today. The school provides affordable tuition coupled with great scholarships and hands-on educational opportunities. There are 19 degree programs to choose from and many certificate programs as well. The college has campuses in Brooklyn and Queens close to major transportation, including the E, F, N, R, M, and D subway lines. For more information call 718-261-5800. The Paralegal Department faculty is composed of esteemed and experienced attorneys who are specialists in their legal fields. Today we are showcasing Professor Benjamin Lavin, Esq. Benjamin Lavin, Esq. is admitted to the Bar both in the State of New York and in the State of Israel. Professor Lavin served as Director of Litigation and Claims for F.O.J.P. Service Corporation in Manhattan for 36 years, specializing in medical malpractice, general liability and personal injury claims. His professional responsibilities included managing, supervising, and guiding investigators, claims examiners, and claims attorneys, as well as defense law firms. Professor Lavin was also actively involved in negotiating litigation claims and in mediations. Prior to this Director position, Professor Lavin maintained a private law practice in Tel Aviv, Israel. Professor Lavin received his J.D. from St. John’s University and his L.L.B. from the University of Jerusalem. He teaches Torts, Family Law, and Probate and Estate Administration. At Bramson ORT College, students get to learn hands-on skills in their field from industry professionals such as Professor Benjamin Lavin, Esq. The college welcomes international students and promotes campus diversity. The Career Services Department assists students with career internships. If you or your school is interested in Bramson ORT's Paralegal Program, online courses, degree or certificate programs, contact the college today. The school provides affordable tuition coupled with great scholarships and hands-on educational opportunities. There are 19 degree programs to choose from and many certificate programs as well. The college has campuses in Brooklyn and Queens close to major transportation, including the E, F, N, R, M, and D subway lines. For more information, call 718-261-5800. The Paralegal Department faculty is composed of esteemed and experienced attorneys who are specialists in their legal fields. Today we are showcasing Professor Randi Seidner. Professor Randi Seidner is a member of the Paralegal Department faculty who teaches on-line courses such as Legal Research and Writing, Immigration Law and Probate. Professor Seidner earned her Bachelor of Science at SUNY Albany with a degree in psychology and she earned her Juris Doctorate at Touro Law School where she was an editor of the Touro Law Review. Ms. Seidner began her career as an associate at a small prestigious law firm and specialized in personal injury defense, representing law school districts and villages. Currently she focuses her practice on conducting research and writing for law firms that specialize in family law matters, personal injury and trust and estate litigation. At Bramson ORT College, students get to learn hands-on skills in their field from industry professionals such as Professor Randi Seidner. The college welcomes international students and promotes campus diversity. The Career Services Department assists students with career internships and job placement . If you or your school is interested in Bramson ORT's Paralegal Program, online courses, degree or certificate programs, contact the college today. The school provides affordable tuition coupled with great scholarships and hands-on educational opportunities. There are 19 degree programs to choose from and many certificate programs as well. The college has campuses in Brooklyn and Queens close to major transportation, including the E, F, N, R, M, and D subway lines. For more information, call 718-261-5800. Sol Z. Sokel, Esq. is an accomplished trial attorney who was born and raised on Long Island. He went to local schools, including Queens College, where he earned honors and an accounting degree (1995), passed the CPA exam (1997), and then graduated from Hofstra University Law School (1999). Before he completed his second year of law school, Sol was recruited by a “Big Six” accounting firm to join their personal & estate tax planning department. It soon became clear that the courtroom was more his passion and Sol joined the AV rated litigation law firm, Kelly, Rode & Kelly LLP. Sol has successfully litigated both plaintiff and defendant cases for over 12 years on behalf of and against some of the most well known insurance companies and law firms in the country, as well as homeowners and landlords without insurance coverage. He practices in the five boroughs of NYC, Long Island, Westchester, Orange, Rockland, and other venues. He regularly publishes legal articles and has lectured to both the general public and experienced lawyers. Sol has also appeared as a guest lawyer on TV and he currently lectures in a paralegal course on the collegiate level. Sol continues to live on Long Island with his wife, raising their five children.